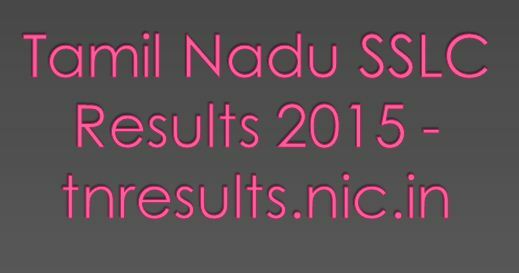 Tamil Nadu Board of Higher Secondary Education (SSLC) is likely to announce the SSLC April 2015 Results expected on 21st May 2015 at 10:00 Hrs. TN Board Results : Tamil Nadu Board of Higher Secondary Education (SSLC) is likely to announce the results of Class 10th Higher Secondary on Thursday, May 21, 2015. The results will be available form 10 AM. All the Students Who sat in the Class 10th exam 2015 can check their TN Class 10th Board Result after its declaration on 21st May 2015 at 10 AM by visiting on its official website: tnresults.nic.in by entering your Roll Number and Submitting it. The exams were conducted in the month of March and April 2015. There are near about 10 lakh Students have appeared in the Tamil Nadu 10th Board Exam and all of them wereeagerly waiting for their Tamil Nadu SSLC Results 2015. The Tamil Nadu Board of Higher Secondary Education has been established for conducting and holding the secondary school examinations. We wish students all the best!